I remember that someone shared with me a tiny photo of Grand Duchess Olga in her wedding dress from a biography... the problem is that the photo was really small and it was impossible to see the details. She was wearing a Western style dress instead of the traditional wedding dress wore by Romanov brides. I supposed that if the veil is actually of Olga, it couldn't be of the second wedding because it was made of tulle. I don't know if there are descriptions of her first wedding dress and veil?? Well that's a real one from her book. As Yelena said it's quite small and blurry. She only describes Xenia's veil in the book. I always wondere if that photo above is from "wedding day" but only after the ceremony? 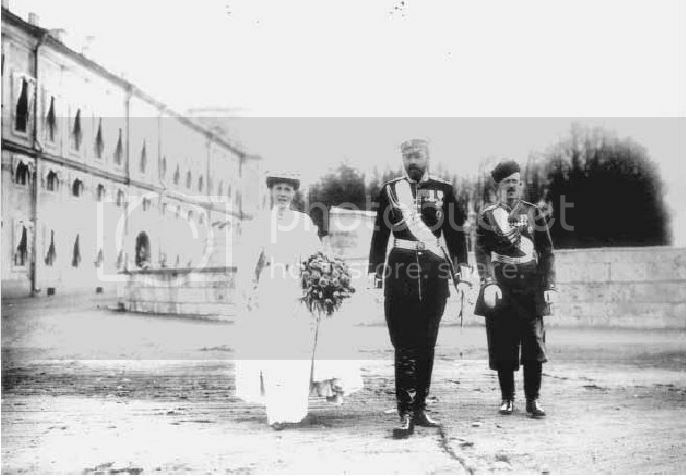 It seems unbecoming that sister of the Tsar should not have a big state wedding, wearing the wedding regalia all Grand Duchesses would! I think it is after the ceremony.